So far Matt Kent has created 23 blog entries. SPEL Class 1 full retention Separator delivery to CRO Ports, South Humberside. 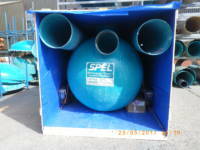 SPEL Stormceptor fuel/oil by-pass Separator crated to be air freighted for urgent requirement in Dubai.